Before I get into the nuts and bolts of this dish you may be asking what are sweet potato noodles? 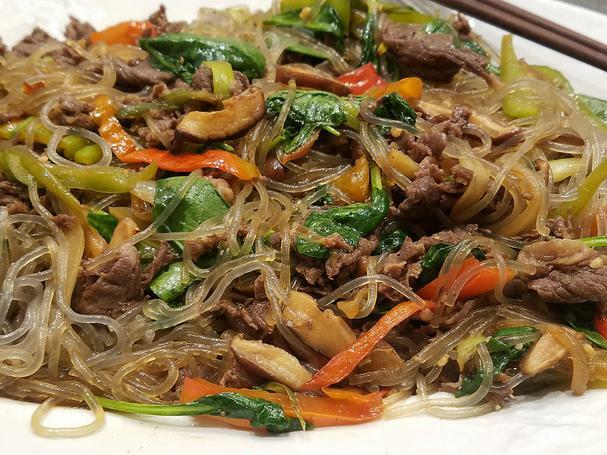 These slightly chewy, translucent Korean noodles are also known as cellophane noodles, or dangmyeon (당면 if you want to practice your Hangul writing skills), which are made out of sweet potato starch. They are more slippery than the typical Italian pasta, but they have a wonderful velvety smooth mouthfeel and are delicious in stir-fry dishes as well as soups. From a nutritional standpoint, they are low in calories (about 170 calories per 1/2 cup cooked), contain no fat or protein, and are low in sodium and fiber (so load your dish up with veggies to get your fiber in!). Bottom line is they are a healthy alternative to traditional wheat noodles, especially for those who need to avoid gluten in their diet. Sweet potato noodles - look for these in Asian markets (some larger supermarkets may also carry them), or buy them on Amazon here. 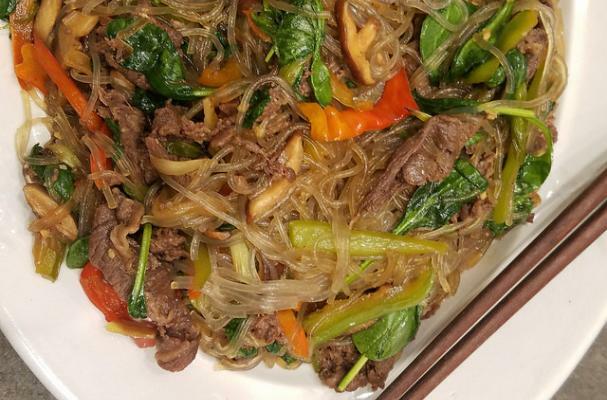 Give yourself a good hour to let the meat marinade, then you're on your way to stir-frying up this delicious dish! This recipe is based on one I found in The Gluten-Free Asian Kitchen: Recipes for Noodles, Dumplings, Sauces, and More. I highly recommend it, especially if you adhere to a gluten-free diet. *Note: I like to keep my dishes as low sugar as possible (i.e. low on the glycemic index), so I use a sugar replacement called Swerve, which is half stevia and half erythritol. You can buy it on Amazon here. Note, though, that it is not as sweet as sugar or other sugar replacements, so you may need to add more to balance the sweetness of this dish. I used about 3 tablespoons of Swerve. First make the bulgogi marinade: combine 2 tablespoons of the soy sauce or tamari (if gluten free), 1 1/2 teaspoons of the sesame oil, 2 teaspoons of the sugar (or sugar replacement), and the sake in a gallon-size ziplock bag. Place the meat in the bag, seal, and massage to mix well. Refrigerate for at least an hour or up to 24 hours. In a small bowl, add the remaining 1/3 cup soy sauce (or tamari), 1 1/2 tablespoons sesame oil, 2 tablespoons sugar (or sugar replacement of your choice), and the garlic and black pepper. Stir and set aside. In a wok or large skillet, heat 1 tablespoon vegetable oil over medium-high heat. Add the onions, peppers, and mushrooms and cook, stirring occasionally for about 3-5 minutes. While the vegetables are cooking, set a large pot of water over high heat and bring to a boil. Add the noodles and cook for about 5 minutes or according to package instructions. Give the sauce a quick stir, then add all but about 1 tablespoon to the vegetables. Toss the vegetables to coat then transfer to a large bowl. Once the noodles are cooked, drain them and add them to the vegetable bowl. Heat the same wok or skillet over medium-high heat. Add the meat and cook about 4 minutes. Add the spinach and the remaining sauce for another 1-2 minutes, stirring to thoroughly coat the meat and wilt the spinach. Transfer meat to the bowl with the noodles and vegetables and toss together until well-combined. Tip: other great additions to this dish are broccoli and carrots. You can also use ground beef or swap out the beef for chicken or pork. For a vegan version, marinate tofu.